I love the 4th of July. It's one of my favorite holidays and has been since I was a child. I so vividly remember the excitement of fireworks outside in the front yard with my family. There was something rebellious and wonderful about getting to stay up late to light glittery sparklers. When my parents first moved to Vancouver, WA they found the sweetest parade. All the children decorate their red wagons, scooters and bikes in red, white and blue. The children wave their little American flags and just beam with pride. It gives you hope. This year my children can't wait to be a part of that fun parade and have already started planning on how to decorate their bikes. It's so sweet and makes me appreciate this country all the more. 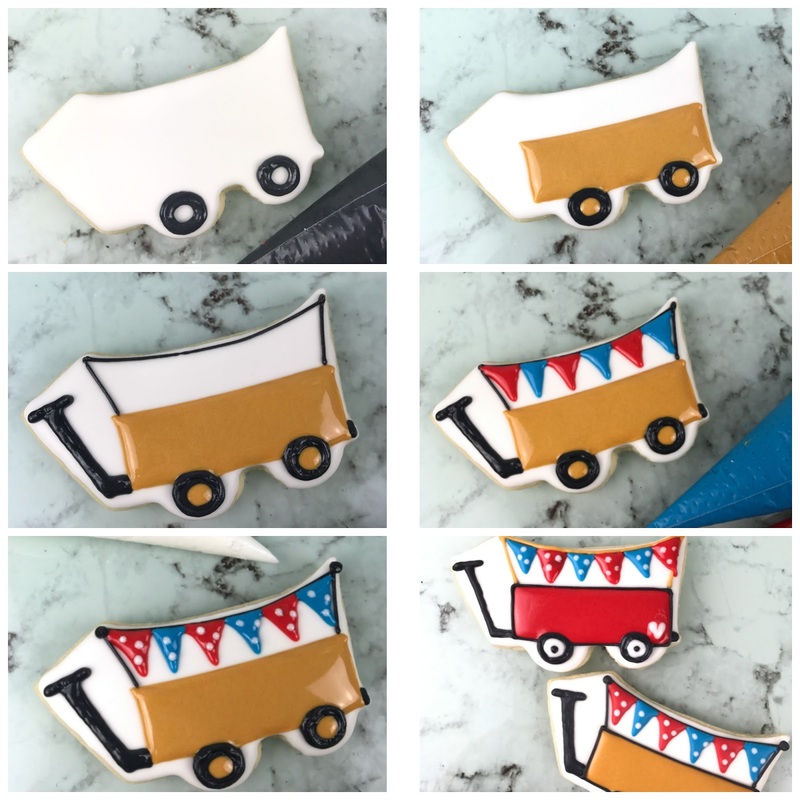 When Shey of SheyB Cookie Designs asked if I would be interested in designing a July set of cookie cutters, I was thrilled! What an amazing opportunity and I already had the scene in my head. I couldn't wait to make and bring these ideas to life. You can buy them soon at her store over here. When my children were young, I hated fireworks. Oh the noise! It seemed liked as soon as I would get them to sleep, BOOM BOOM. But now that they are older, we all love them again. I love to watch their faces full of excitement as the colors burst in air! 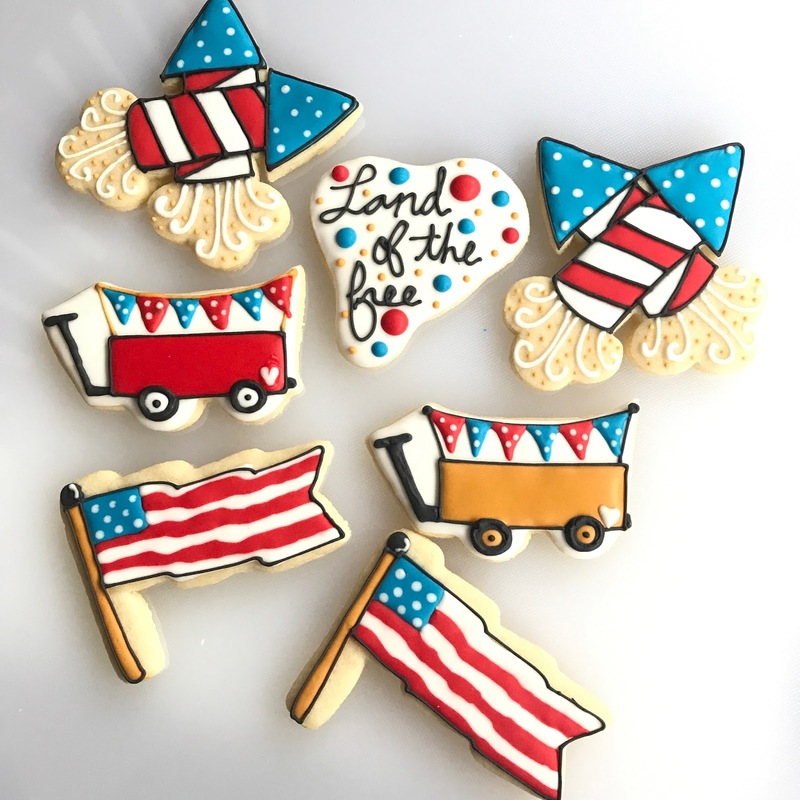 These firecracker cookies are a snap! What do you need? All of the icings were used in tipless bags and were created wet-on-wet. You'll see that I do the black outline twice - it's a little trade secret. The first round of outlining helps you ice with clear definition of where everything goes. However, the flood icing always spreads a little too much over on the outlines and you lose that coloring book appeal. Be careful when icing the second time, this is what will stand out. Never dip your tip on to the cookie, just hover slightly above it.So gorgeous when you are done! 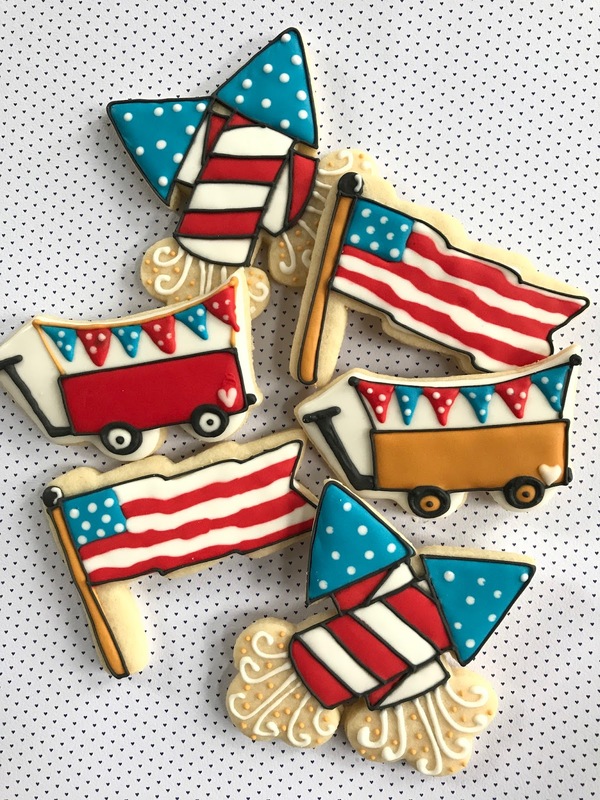 The decorated wagon cookies maybe my favorite. There something about the sweetness and love of a child. These are equally easy - just break it down into shapes. Wouldn't these be adorable with the child's name personalized across the wagon? I just love it and I'm busy coming up with alternate themes we can do with this sweet cookie cutter. And of course, our flag softly waving in the breeze. This is a great one if you are wanting to try more wet- on-wet. 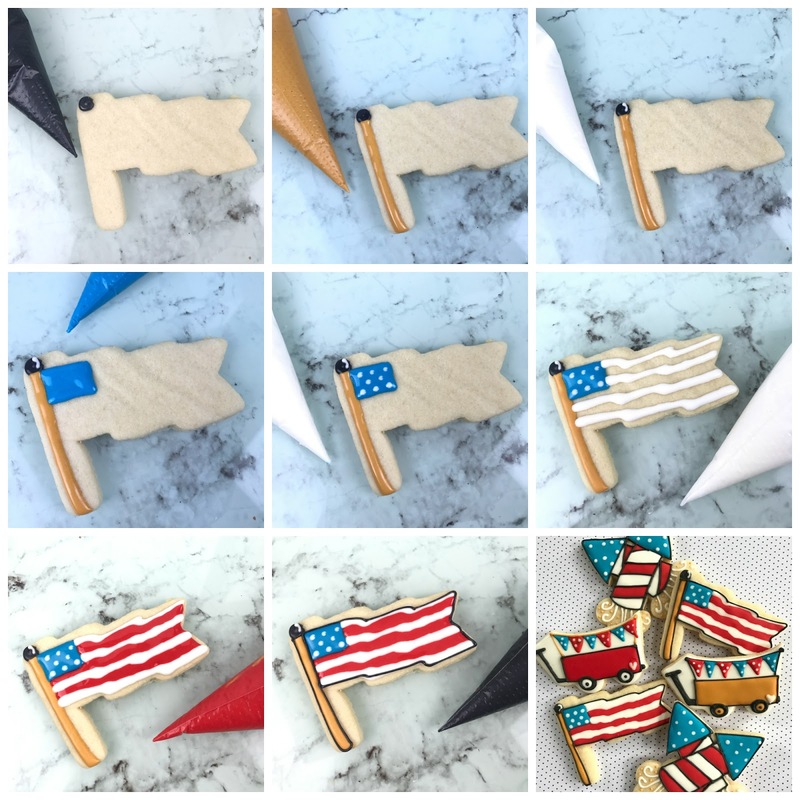 The flag stripes are not intended to be straight lines, so don't stress! It's a flag waving in the air, the lines should cascade down and slightly jagged. I've always loved impressionism art most, embrace that looseness with this one and you will be happy! I hope you love my very first design of cookie cutters. It was an absolute dream come true and I can't wait to bring you more designs. 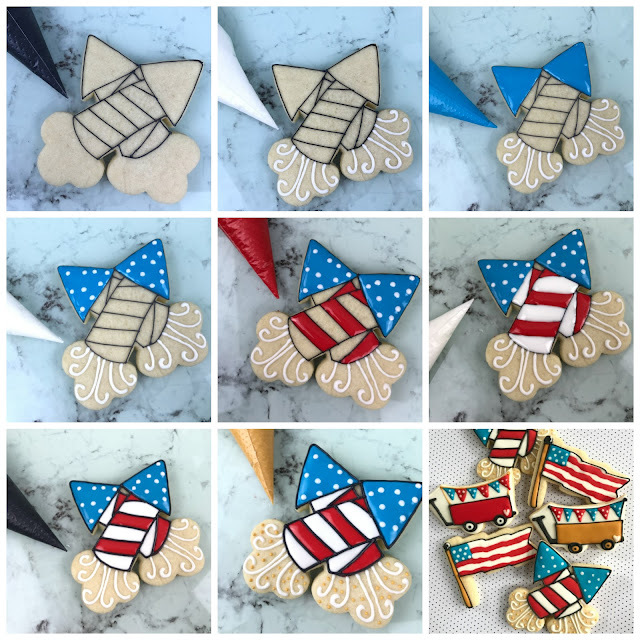 So check in with Shey soon - she has such an amazing line of cutters. I want that giant unicorn cookie cake! !